Facom is Europe’s leading hand tool brand working for over 95 years with industrial maintenance and automotive repair professionals. Part of the world’s largest hand and power tool company, Stanley Black & Decker delivering innovation, continuously designing and improving the tools to save time, increase productivity and safety. With a range of over 9,000 products, including storage (trolleys, cabinets, benches, portable storage), standard tools (wrenches, screwdrivers, pliers, hammers) and specialist tools (automotive, electrical, aerospace) to meet the needs of all repair technicians. A player in the hand-tool sector since 1918, Facom is synonymous with quality. 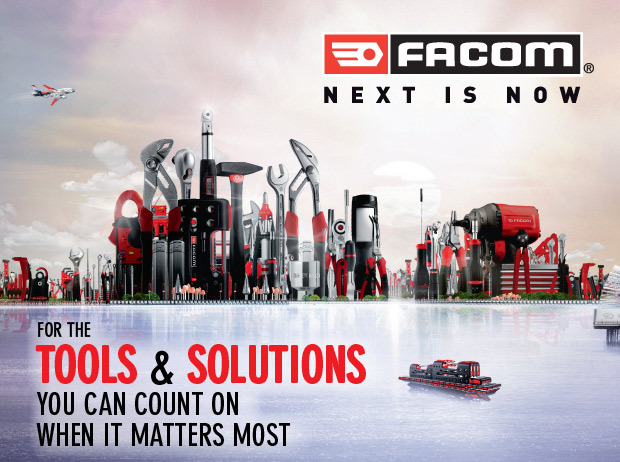 Thanks to its knowledge of the market and daily contact with professional users, Facom has succeeded in developing tough, innovative and safe high-performance tools supplied with a lifetime guarantee offering tool replacement and repairs. Like quality, the Guarantee is integral to Facom’s commitment and the reputation of its product range. You can be safe in the knowledge that your tools have been safety tested to the highest degree to ensure they won’t let you down, even in the harshest of working environments.